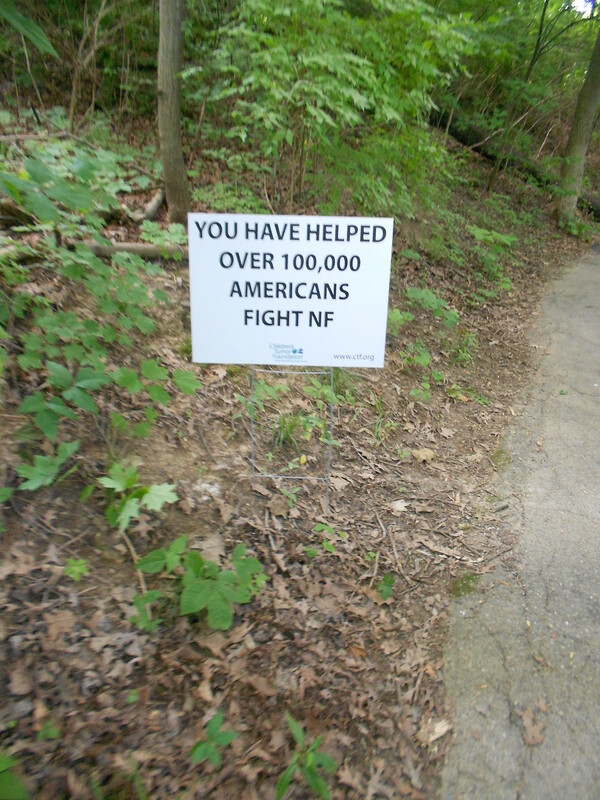 Well, it came and went–May, as I forgot and was reminded yesterday–was NF Awareness month. It was also Autism Awareness month. I don’t find it necessary to tell you facts or stories of NF–you have already read my blog entries. 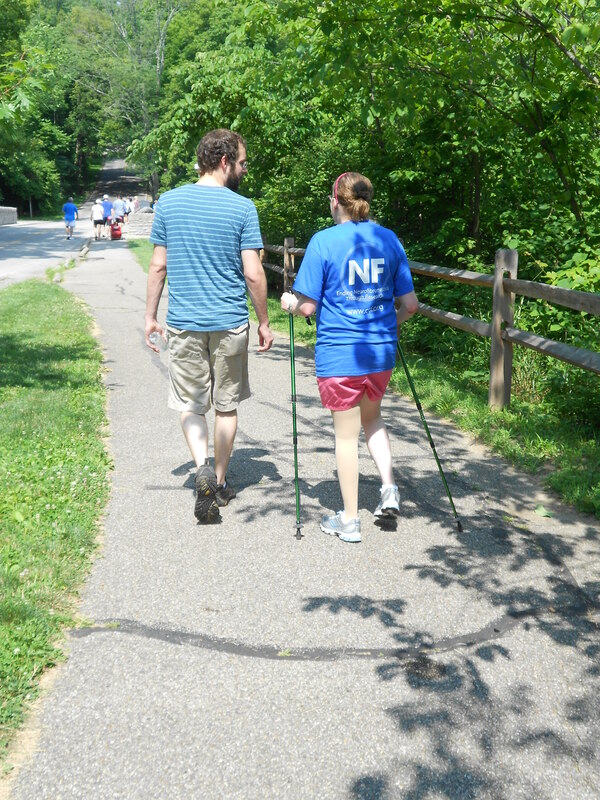 So, I will end this NF Awareness month with something different–none of the talk, such as, “This is a side effect of medicine or tumor function;” But talk of living life with NF2–because, I will tell you plain, it has, is and will continue to change my life. Once in a conversation with my friend Jess, we discussed our thoughts and feelings about the topic of researchers finding a cure for our disease. I thought about it for a long time and finally responded to her email, saying that I cannot imagine life without it. Please don’t consider me a strong person, because if anything, this disease knocks you down. There are more moments were I detest my own body, wishing that I was something more rather than being thankful for what I have–in other words, as my body continues to unwind, I feel left behind. Yet looking back at the road thus far, I am aware that life has been filled with divine moments. Moments where God met me in my lowest state and helped me back to my feet, never leaving me behind. And so life continues–to the end, which is the beginning of Life. 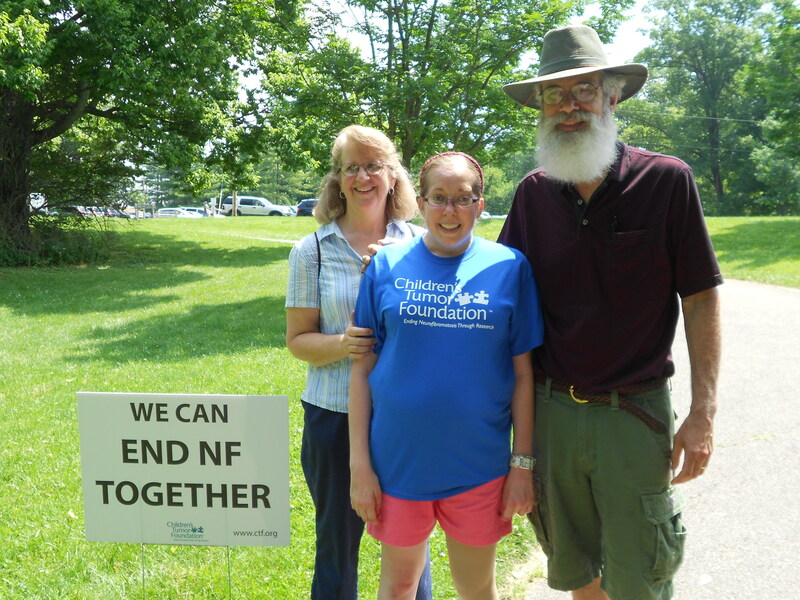 Last summer, I had the opportunity to take part in the Children’s Tumor Foundation NF Walk. 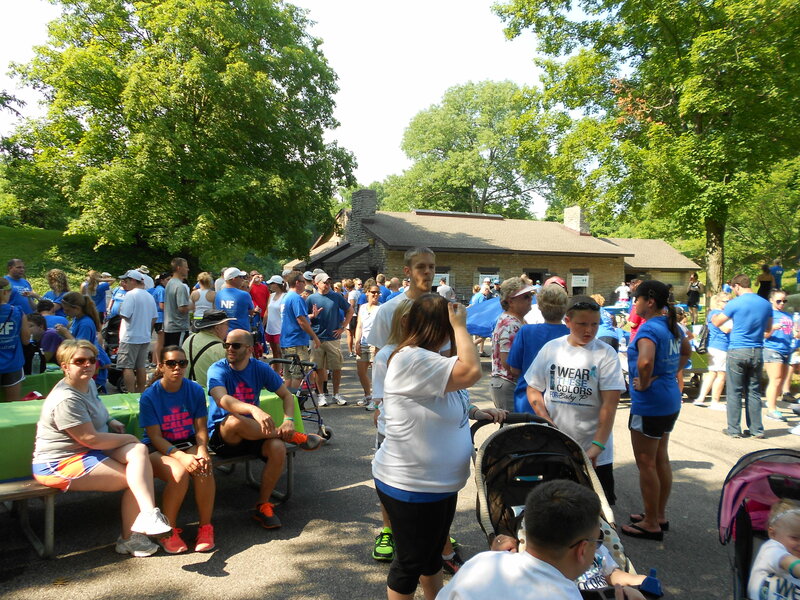 This fundraiser walk proceeds funding for continued awareness and research about the disease, as well as treatments for those individuals living with either NF1 or NF2. 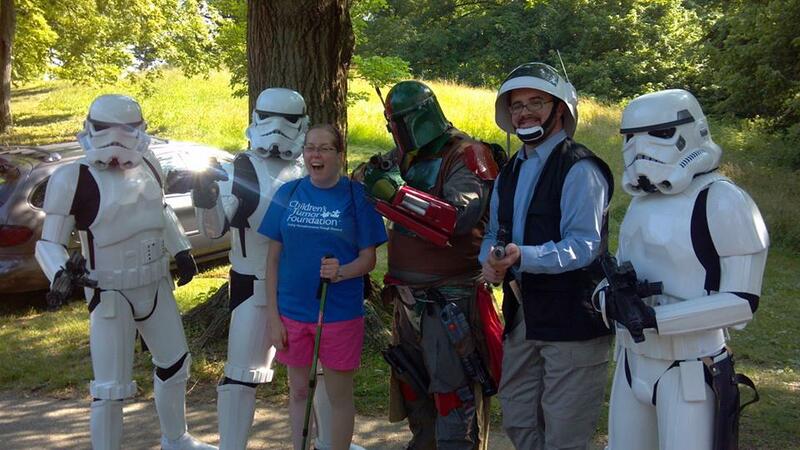 The Children’s Tumor Foundation selects cities across the states and holds this event all throughout the summer. 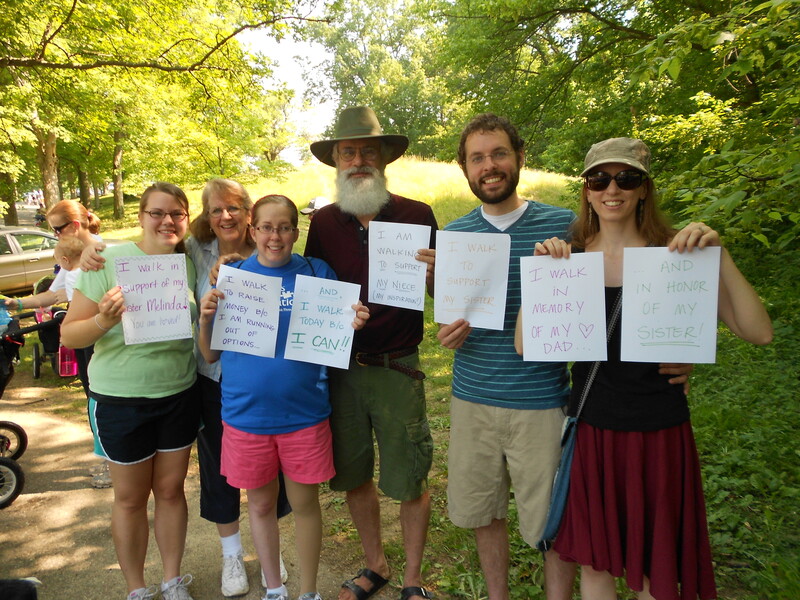 Last summer, I got the information for the walk taking place in Cincinnati. It was more a spontaneous decision, but I was very humbled by all the support we quickly raised. 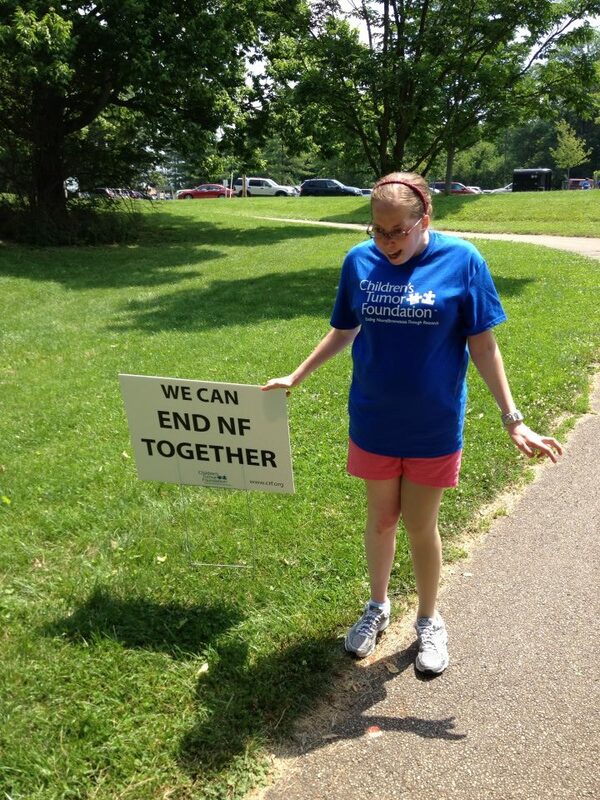 When I learned that the NF Walk would again be in Cincinnati this coming June, I knew I would want to participate. 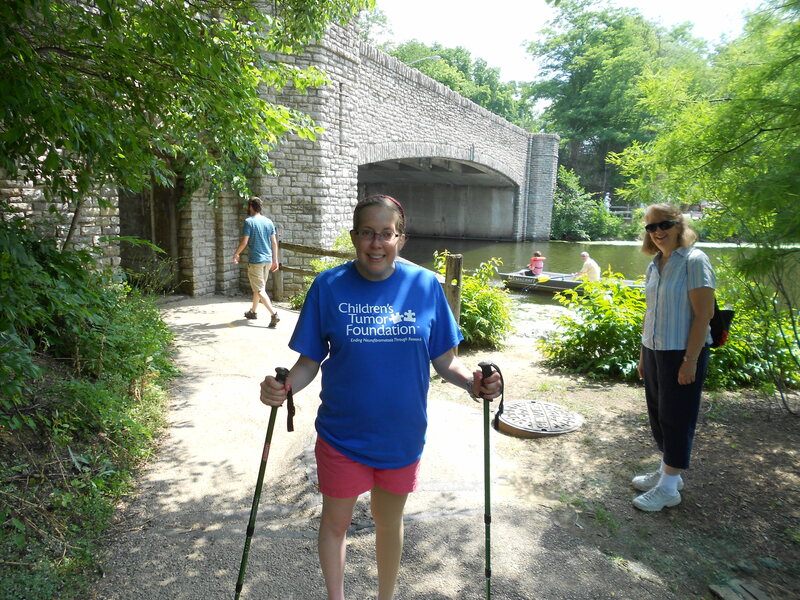 Last year it took me an hour to walk the two-mile course…I used my walking sticks and towards the last stretch, depended on the arms of my sister and aunt. This year, my plan is to push a wheelchair–when I no longer have energy and need to rest, I will depend on someone else to help me to the finish point..walking the second mile. My Team name is”A Mile in Mel’s Shoes.” Through this blog, you have experienced the journey right alongside me–the sorrows and heartaches, questions and pondering thoughts, cheerfulness and laughter. 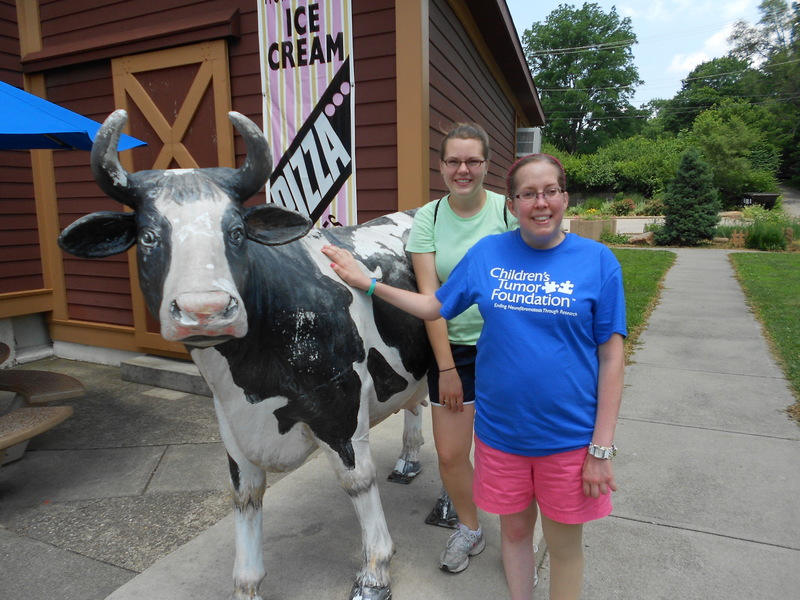 Unlike the set course of the NF Walk, the next mile in my life is uncharted. It is a walk of faith. You have walked the first mile in my shoes–and I know you will be there, ready to continue walking another. 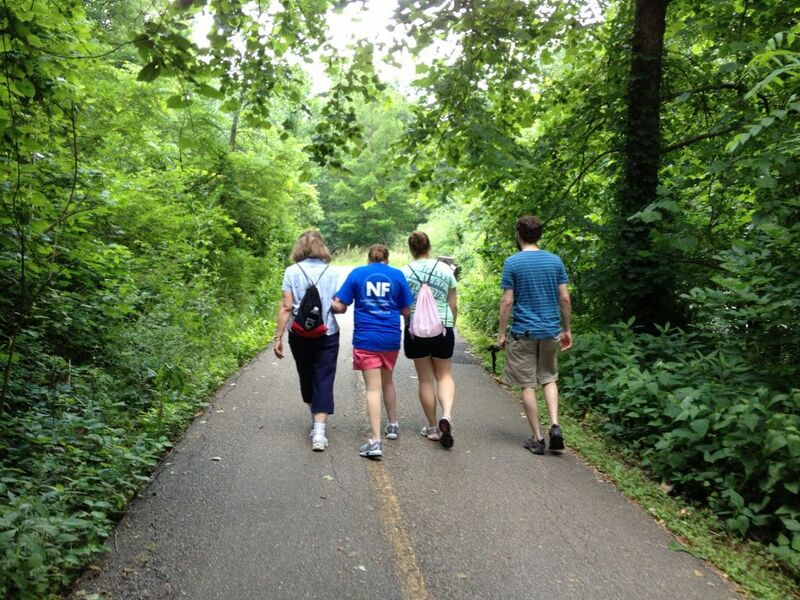 Linked below is the website for Team “A Mile in Mel’s Shoes.” If you are interested in joining me, my parents and two best friends since grade-school (coming for a weekend visit! 🙂 ), click on the “Join my team” button for registration. If you would like to give in donations, please select “Donate now.” You can also donate to a team member’s personal page (names are listed at the bottom of the Team page), where comments can also be written. All donations given on either goes towards the team goal. Thank you for walking with me. The journey continues, one step at a time. In the Gospel of Mark, chapter 2, Jesus is continuing his ministry of teaching the people and performing miracles. At Capernaum, Jesus was at a house where the crowds of people came in at so much abundance that there was no room to get into the house, let alone by the door. Which is easier to say to the sick man, ‘Your sins are forgiven,’ or to say, ‘Get up, take your bed, and start to walk?’ I am doing this so you may know the Son of Man has power on earth to forgive sins.” He said to the sick man who could not move his body, “I say to you, ‘Get up. Take your bed and go to your home.’” At once the sick man got up and took his bed and went away. Today, childhood friends from my hometown, sister and brother-in-law, and friends from college days walked the Children’s Tumor Foundation NF Walk in Denver, Colorado. 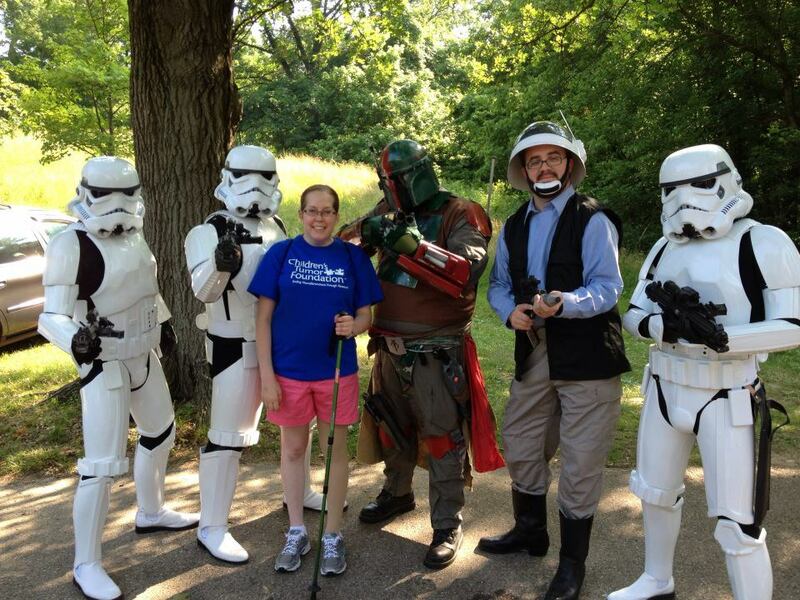 Their walking as a team and raising support on my behalf for the foundation and its future research made me think of the four friends of the lame man. 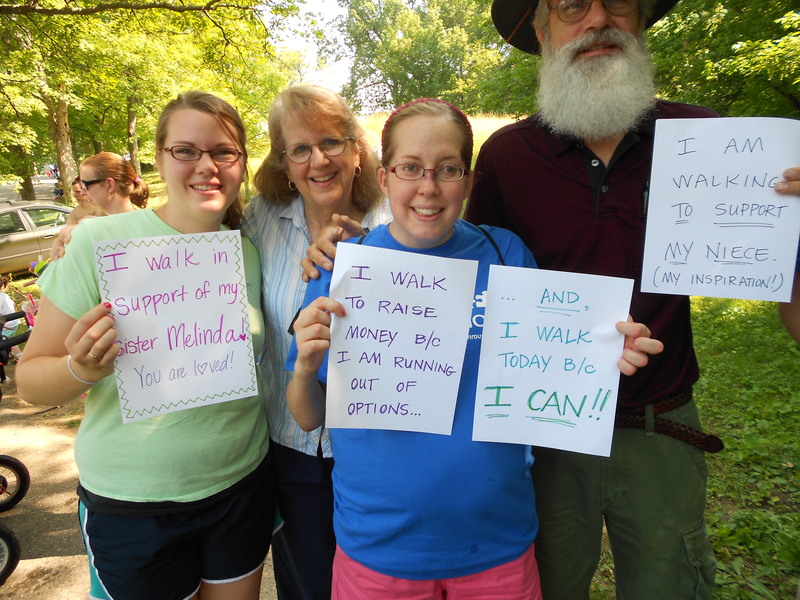 They walked with the same hope as any persons living with a disease: that someday there will be a cure. 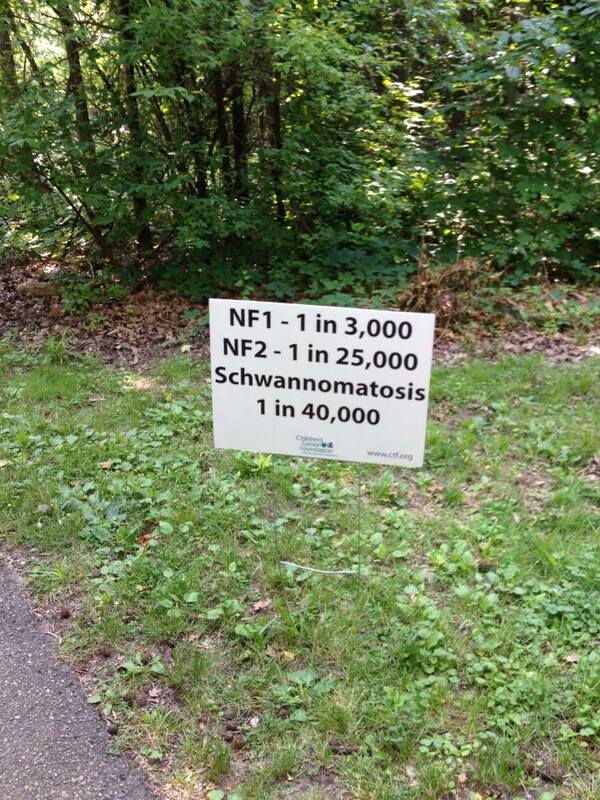 Right now there is no cure for my disease (that circumferences NF1 as well.) 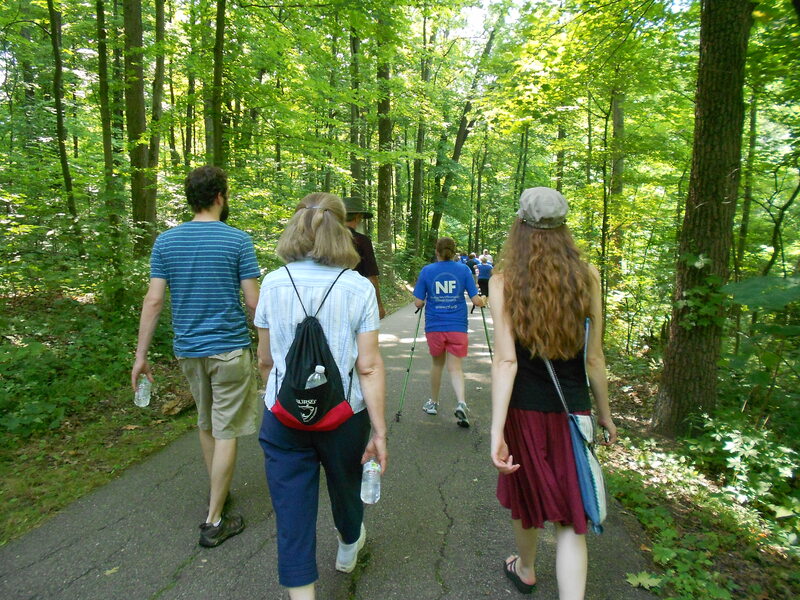 Sometimes these walks for diseases seem so helpless in the bigger picture of the dying world, but what matters is keeping the focus on a hopeful future found in Jesus Christ. But it is easy for me to lose sight of hope when all I see everyday is my body aging away. I don’t even know what to pray for at times. I know God has given knowledge and wisdom to countless research teams and doctors across the world to help patients such as myself; I am very thankful for my team of doctors and therapists and trust their guidance. But even they can only do so much. It is our human nature. It is where “God Room” comes into faith. I just finished Franklin Graham’s autobiography, Rebel with a Cause: Finally Comfortable Being Graham. I know I am about fourteen years behind from when it was written, but I am glad I took the time to read it as it taught me a few lessons in life and faith. ‘God Room’ is when you see a need and it’s bigger than your human abilities to meet it. But you accept the challenge. You trust God to bring in the finances and the materials to meet that need. I thought about this in my own life. With starting Physical and Occupational therapy a lot of my mindset has been, “These are things I can no longer do easily on my own or at all on my own.” It gets frustrating. So last night, I prayed for “God Room.” I didn’t go through my whole list of things wrong in my body. I figured God already knows that…but what I focused on was trust–trusting that God would (will continue) to meet my needs–both physically and spiritually. My physical condition is out of the ability of myself and doctors…but not out of God’s ability. With Him all is possible…and that means the “God Room” is pretty big! *Graham, Franklin. Rebel with a Cause: Finally Comfortable Being Graham. Nashville: (Thomas Nelson, Inc., 1999.) Page 139.